A large part of the coursework is experimenting with ingredients, ratios, and techniques, which I am loving. I know from personal experience that this is a great way to learn, but sometimes it can be hard to find the time to just plain ol’ experiment with no guaranteed end product, especially when I’m sharing two new recipes a week. As part of module two I ended up spending a couple days blending together different ratios of butters and oils, playing with whipping, mashing, melting, and more. It was awesome and so freeing to be able to come at it from an angle of “I wonder what will happen” rather than “this needs to work for X”. I filled pages of my Formula Botanica notebook with notes and observations, and used a lot of washi tape to distinguish my experiments from one another. This particular butter blend came about after more than a dozen different experiments (many of which are still sitting on my shelves for observation… stay tuned for some lovely whipped butters if they keep holding up as they have!). I wanted something soft and rich; something I could press my thumb into easily. Something malleable and smooth, with good scoopability and slip. I wanted it to be decadent but not heavy or sticky. I played with a lot of blends of soft butters and liquid oils before hitting on this combination and these percentages. The ingredients look simple, but the results are decadent. So, what are those ingredients? For soft butters we’re using a blend of mango and shea butters. 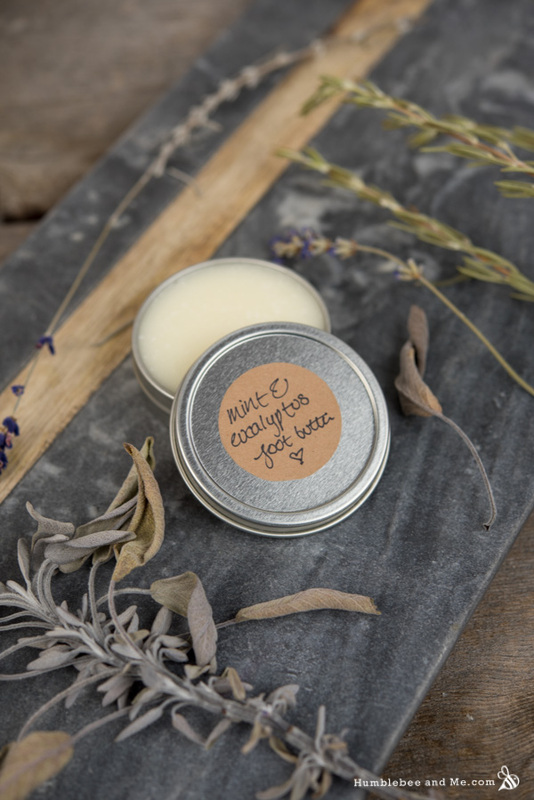 Shea butter is a pretty classic choice for foot things as it’s very nourishing… but also rather heavy and greasy. It’s lovely for skin, and that heaviness works wonders on dry feet. Slather some on before bed, pop on some socks, and wake up to pampered feet (just be sure to wash those socks well!). I wanted to include shea for its skin softening goodness, but I also wanted to counter the greasiness with mango butter, which is pretty much the opposite of shea butter in terms of skin feel. It’s a rare butter with a dry skin finish, making it the perfect foil to shea. I also added a bit of cornstarch to the blend to further reduce the oily feel. 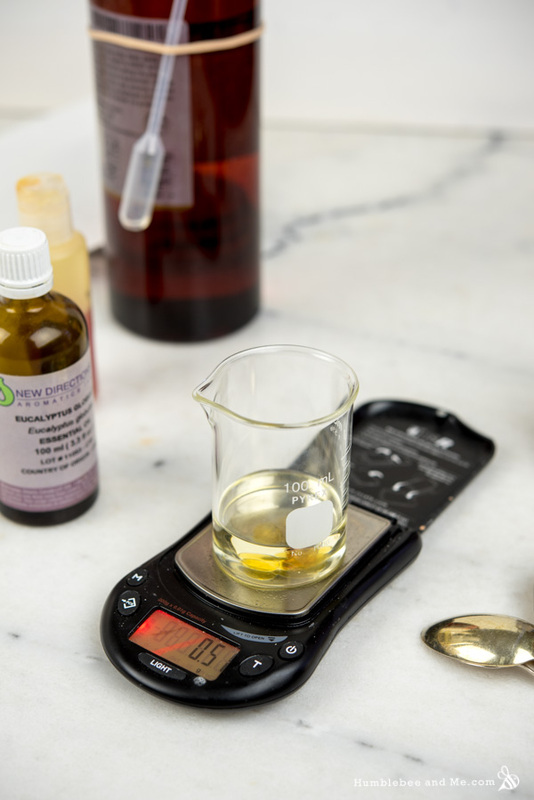 Our cool down phase is mostly safflower oil, though you could easily use a different light liquid oil. I’ve also included vitamin E to extend the shelf life of our concoction by slowing rancidity, and then of course our essential oils. 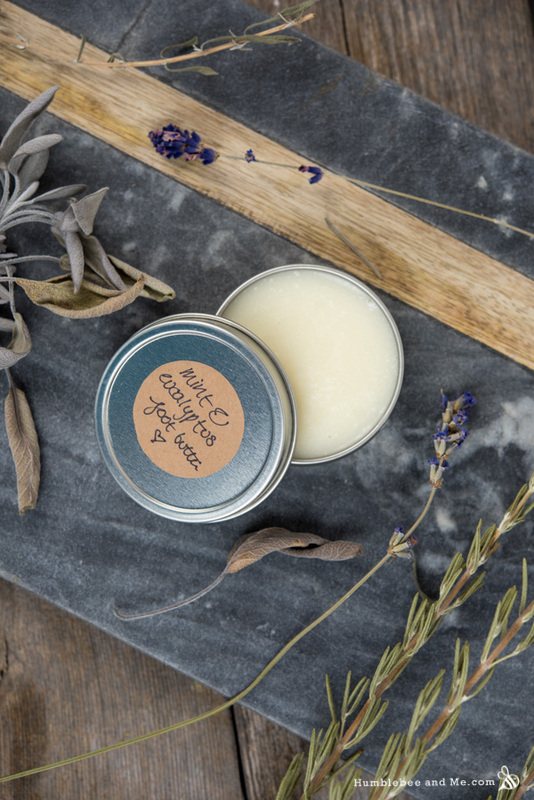 Clean, herbaceous eucalyptus blends beautifully with bright, perky peppermint. Mmmm, foot pampering goodness. Beyond the blend of ingredients, the technique is important, and something I learned from Formula Botanica. In order to skip the graininess that can happen with soft butters (especially shea butter), we’re cooling the whole lot in an ice bath and stirring until we reach “trace”, similar to soapmaking, before pouring. I am in love with this trick—my two month old experiments are still silky smooth with no hints of graininess! 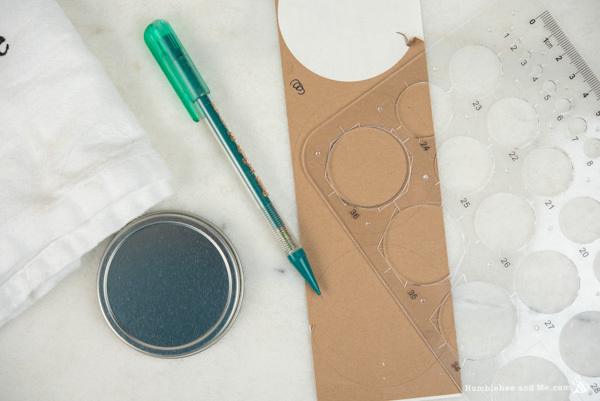 A huge thank you to Michele for this wonderful circle template—she gifted it to me at the Melbourne Humblebee & Me meetup and it is infinitely easier to use than a compass! 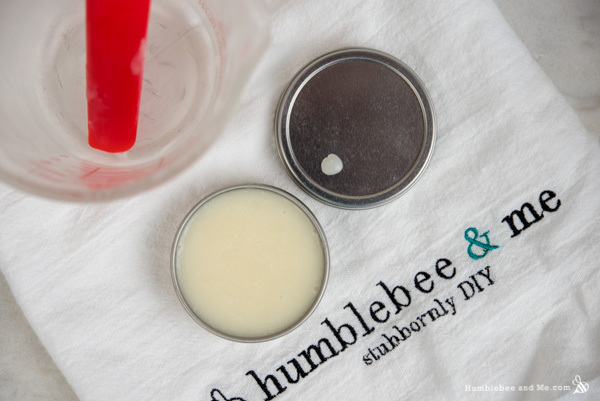 Alright—for all that chat this Eucalyptus Mint Foot Butter is really simple and easy to make. 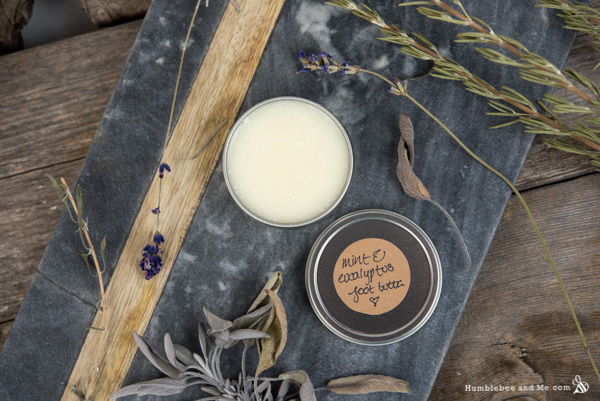 A few plant-based butters and oils come together to create something that is so much more than the sum of its parts. Enjoy! 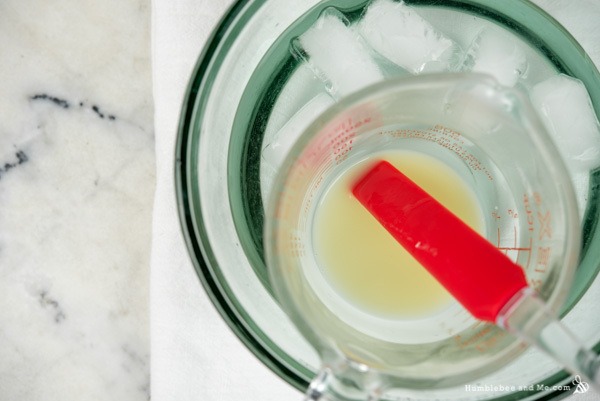 Once the heated phase ingredients have melted remove the measuring cup from the hot water bath and place it in the ice bath. Stir constantly with a flexible silicone spatula, being sure to scrape down the sides frequently. After a minute, stir in the cool down phase ingredients. At that point pour the mixture into a 60mL/2oz tin. Leave it to set up for at least an hour before using—it should appear solid. The set-up time will vary depending on ambient temperature (if you’re somewhere quite hot, popping it in the fridge would be a good idea). As I’ve provided this recipe in percentages as well as grams you can easily calculate it to any size using a simple spreadsheet as I’ve explained in this post. 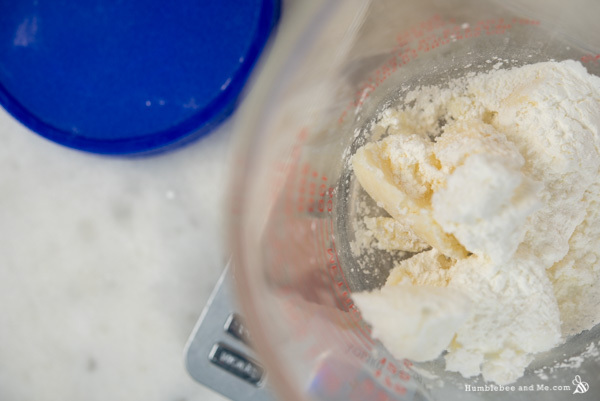 As written in grams this recipe will make 50g (1.76oz). You can use all shea butter or all mango butter if you don’t have both butters. All shea butter will make for a greasier product, all mango butter will make for a drier product. 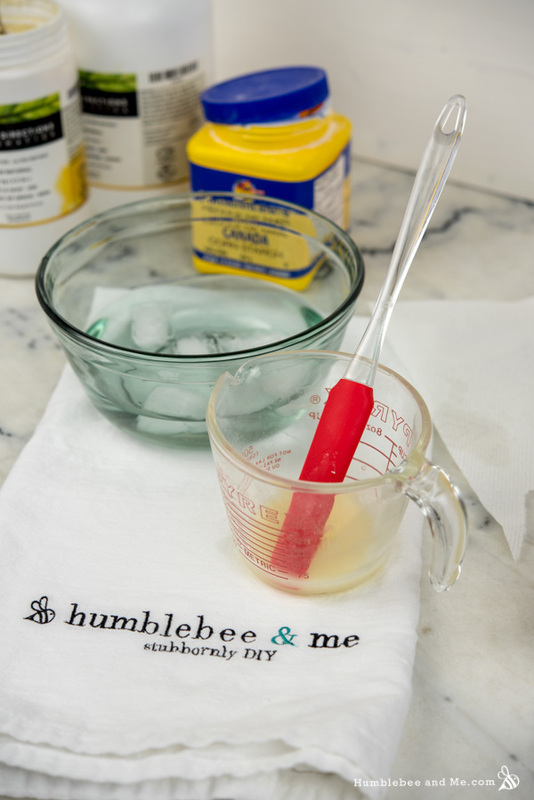 You can use wheat starch or arrowroot starch in place of the cornstarch. A different lightweight oil like sweet almond, grapeseed, or sunflower seed will work well instead of safflower oil. You can use eucalyptus radiata essential oil instead of globulus. I haven’t tried all the different varieties of eucalyptus; I suspect many of them would work well. 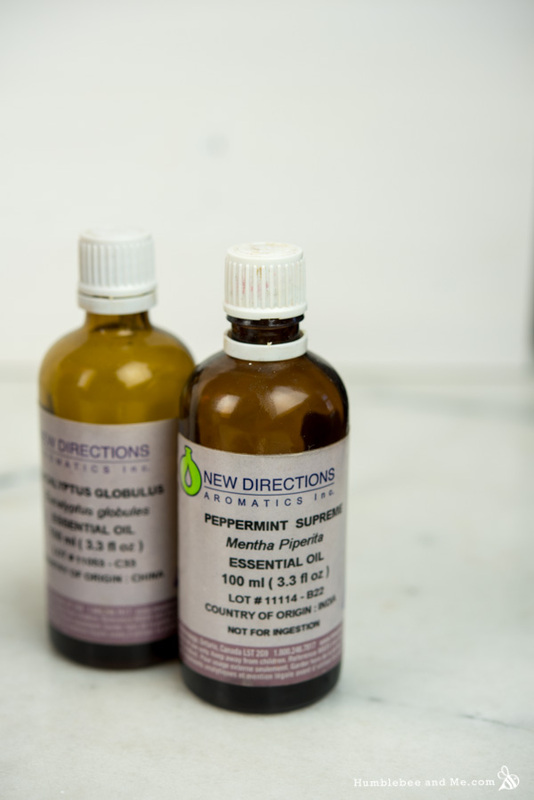 If you want a stronger minty sensation you can increase the peppermint by 1% and decrease the safflower oil by 1%. I wept when I tossed my shelves of my experiments! I’m glad you are enjoying your program! And yes! I love your hand towel! That is so cute! I can feel my feet tingle from here! I really need to use my Eucalyptus Essential Oil. It will help keep my tender tootsies nice and soft! I finally got around to using something called, “Foot Baby” where you war this bootie for an hour, and five days later your skin peels all off. You actually shed. And left with awesome soft toes! Ok…. “Foot Baby” sounds horrifying. And also oddly satisfying, like picking scabs or something else gross but… yeah… what is in that magic sock!? It’s a chemical peel in a sock! And it is very satisfying to watch your gross cracked heel skin peel off. I do recommend this! I BET! Oh my goodness. I’m tempted… but also… I like my feet to have some toughness to them for cavorting around barefoot. Hmm. What is the purpose of the cornstarch? 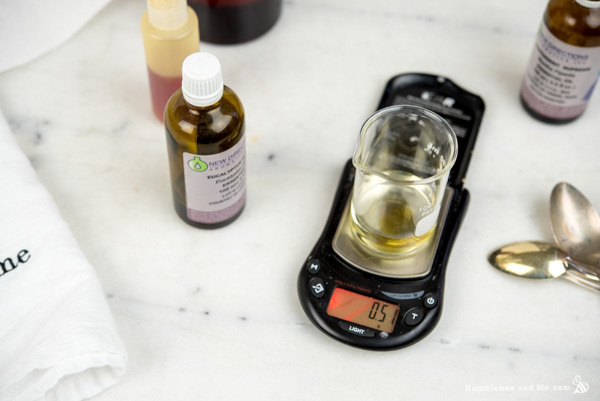 Is your essential oils weight of 0.38g each is OK ? Because it look strange for the number of drops really different one from an another. Eucalyptus and Mint are two of my most favorite scents and together they are a powerhouse! Thank you for this amazing recipe. I can’t wait to try it!!! I see in your video you have a small heating element. Where are those purchased? There is no heating element in this video…? Hi there, I would like to asked about the Formula Botanica. When I wanted to sign up the course, I came across with this review at internet. Please comment something as I am confuse. Thanks in advance. I ended up speaking with Lorraine personally about this review while I was in London. This rather defamatory review (that is mostly about Lorraine, which seems odd for a review about a course) is not from anyone who has ever actually studied at Formula Botanica. They know this because it was posted to their Trust Pilot account/page, Formula Botanica flagged it, and Trust Pilot (as per their policies) asked for proof that the review had been left by a genuine customer/student. None was provided, so the review was removed. So, rest assured that whoever wrote that review has no knowledge of the inner workings of a Formula Botanica course. Hi Marie…Oh my goodness! You’re a FB student and I’m eagerly waiting to apply for the International Enterpreneur of Organic Skincare course on the 24th of this month! I’m glad to hear you’re enjoying the course. I love all your recipes and I made a lot, both from your blog and from your book! This recipe looks divine. Great work and keep it up! Who knows, maybe we’ll cross paths on the Formula Botanica social platform? Marie, I made this over the weekend. You are so right, the texture is just lovely. And the peppermint/eucalyptus combo smells divine. Thanks for another winner! Just made this last night after my foot cream ran out. Just wondering if you will have your full review about Formula Botanica out soon? I am very interested in it but saw some really negative reviews from 3 years ago and have started to second guess joining. As the course opens today just want to hear your opinion as I do respect it. It won’t be out terribly soon as I’m still not done the course. That said, I think it is a good course for makers who want to learn to formulate, especially ones who want to go on to sell their products. 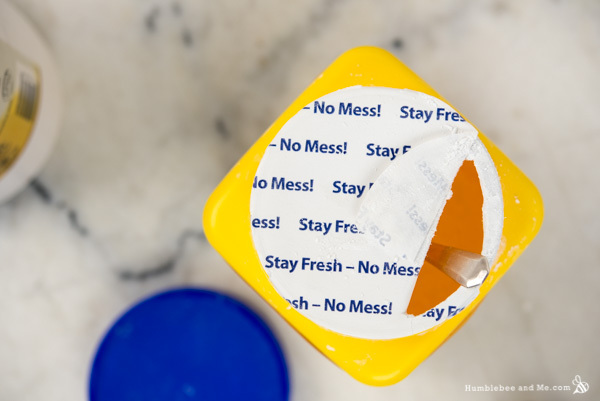 FB does a good job of teaching how to dissect ingredient lists, create formulas, and understand what different ingredients do and why they’re in a product. They are also safety focussed and emphasize EU compliance, which I think is really important. The course work encourages experimentation, and the more you do the more you’ll get out of it. The main criticism I’ve seen levelled against the course is that it’s not a university degree in cosmetic chemistry, which I feel is fairly obvious in that it’s ~$1000 and can be completed in six months. Degrees take years and cost tens of thousands of dollars. 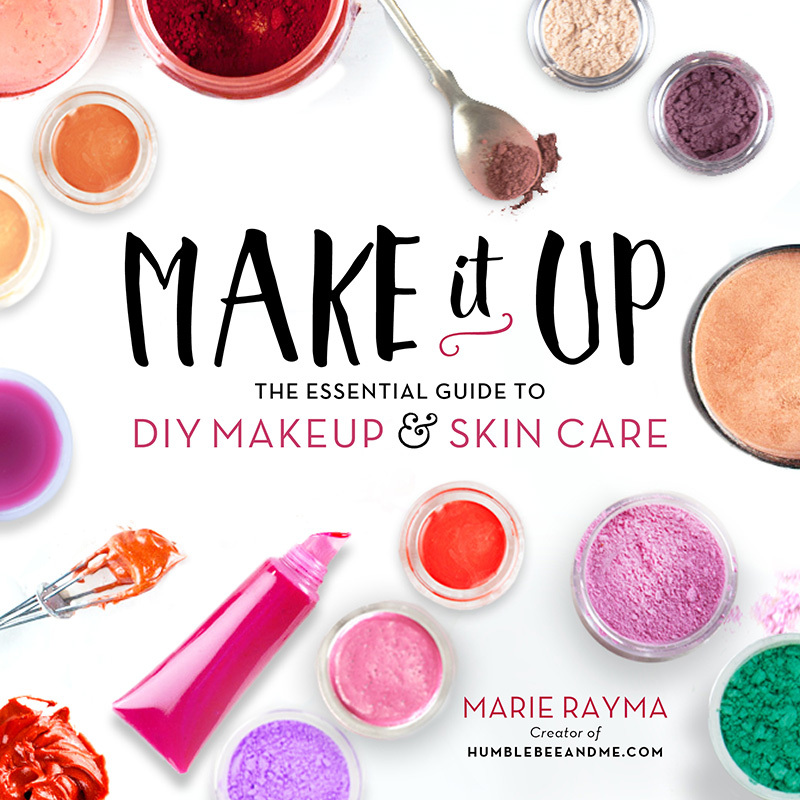 It is also more focussed on formulation than chemistry, so if you want a deep dive into cosmetic chemistry, the course I’m doing isn’t that, though later courses may provide more detail. I hope that’s helpful! Thanks for the information Marie. It is most helpful. The same thing happened to me when I made a double batch. I’ll try Marie’s suggestion of re-warming and cooling again to see if I can salvage it. Given the constant here seems to be the larger batch size that does make me suspect the larger batch size is the “thing”. It makes sense that everything would take longer, and it could possibly be longer than it seems like it should be. I would definitely recommend experimenting with using the fridge or not. This post from Skin Chakra is also wonderful and incredibly helpful! Hi Marie, I made this over the weekend but I think maybe I did something wrong. I left it in the fridge to set, but as soon as I take it out for a bit it starts to melt, like the oil n butter did not mix together. Do u think maybe because the ice bath part I didn’t do it long enough? Any advise? Thanks! Hey! How hot is it where you are right now? It is around 25-35 degree Celsius where I am. That’ll do it—that’s a good 5–15°C warmer than the temperatures I developed the recipe in. You will likely need to adjust the recipe ratios more towards solid ingredients. Thank you! I’ll try to adjust the ratio. Thanks! Tisserand states the maximum dermal usage rate at 5.4%. Thank you, I should have checked it myself (as I have his book too) before asking :). 🙂 It is a great book! Hi Marie. I absolutely LOVE everything about this foot butter. I have made it three times and my friends keep “stealing” my jars of it. I have to admit that I also did a hybrid of the base of this butter with your essential oil blend for your eczema butter for my husband (as I love the feel of this butter). I swapped the safflower oil for olive oil with a bit of tamanu oil. It has started to help to the point where he has asked me if I could “make more of that special stuff” 🙂 I am so happy I have found your site. I have only made products with the basics in the past (I think you call them crunchy haha). You have given me the confidence to branch out to include more ingredients (my order arrives this week woo hoo!!!). Just look at all of the “special stuff” I’m going to make. Thanks again. Thank you so much, Cindy! I’m so thrilled you are loving this recipe and I’m beyond stoked to hear you’re feeling more confident and are planning on branching out into new (and super fun!) territory 🙂 Happy making and thanks so much for DIYing with me!